Help Yourself to English: Video: Julian Assange of Wikileaks - hero or villain? 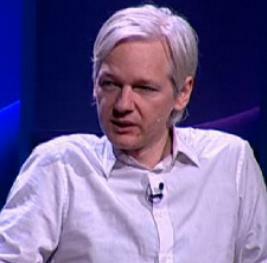 Video: Julian Assange of Wikileaks - hero or villain? The controversial website Wikileaks collects and posts highly confidential documents and videos. Its creator Julian Assange is considered by some as a heroic campaigner for press freedom and by others as a troublemaker exposing diplomatically-sensitive information that should be kept secret. In this interview from the TED site, you will have the chance to judge for yourself. Video time: 19 mins 34 secs NB Subtitles available in English or French. Task: Watch the video. At one point, the presenter Chris Anderson asks the audience if they consider Julian Assange to be a "people's hero" or "a dangerous troublemaker". What is the majority view? What's your own view?